Tomorrow the AT board meet for their penultimate meeting of the year and it looks like it will be a big one with a lot on the agenda of their closed session. I’ve added my thoughts after many of the items. Panuku Framework Plans – I assume this relates to AT working with Panuku Development Auckland on plans for the areas they’re focusing on redeveloping. Dominion Road Bus Lane Improvements – When AT announced they were looking seriously at light rail for Dominion Rd, the planned upgrade that was about to go ahead was put on hold but now that ATAP appears to have pushed LRT out, it’s important that AT make some improvements to the bus lanes now. Hopefully this means they’ll be extending the lanes, including through intersections rather than stopping short like now and extending the hours of operation. Clonbern Road Carpark – AT have indicated previously that there’s a redevelopment proposal for the carpark they own on Clonbern Rd, Remuera. Execution of Deed by Directors – Lease of upper levels CPO – Presumably this is for after the CRL works have finished. 2017 Annual Fare Review – It will be interesting to see if AT propose any fare changes given they’ve just made some with the introduction of Simplified Fares. If they do make changes, past years indicate they would be implemented in January. CRL Procurement Update – I assume this item related to AT holding a day long industry briefing on the main works of the CRL later this month before tender documentation goes out next year. MRT/LRT Update – One of the outcomes from ATAP was the use of the term Mass Transit instead of Light Rail for several projects. Essentially the NZTA are busily trying to show that a bus only solution to capacity problems can be found but my guess is they will do so by ignoring the capacity issues on city centre streets. Parnell Station Update – It appears that Kiwirail have already started some works to move the old Newmarket Station building to the site, presumably this will update progress. Moving on to the items that got my attention in the main business report, in the order appear in the report. AT say the handheld devices used by ticket inspectors to check HOP cards are at the end of their life and they have a project underway to replace them. The Mt Roskill Safe Routes is now complete and due to be officially opened on Wednesday while the first stage of the Glen Innes to Tamaki Dr path – from Merton Rd to St Johns Rd – will open on 16 December. AT are hoping mediation will solve the appeal by Cowie St residents against the bridge that will replace the Sarawia St level crossing. If it doesn’t, the environment court appeal is set down for February. The Half Moon Bay ferry terminal is progressing with the wharf works due for completion in January and the land side works in April. As mentioned this morning, double deckers are due to be rolled out on Onewa Rd in February next year. AT say DD mitigation works also planned for Gt North Rd in Feb 2018 and Manukau Rd in June 2018. AT say they’re on track to meet their target of rolling out 19km of bus lanes this financial year, despite them later in the report claiming to have a target to roll out 26km this year. The roll-out of the new bus network in West Auckland is scheduled for 11 June 2017. AT are in the middle of assessing the bids for the Central and East networks and have now gone to tender for the North Shore services. We’ve mentioned before that AT are finally looking at boosting capacity of services prior to the regular March Madness. There’s a little more detail about what this entails. For the NEX they say approximately 25-35 extra peak trips will be added in January-February 2017 – but it doesn’t say what timeframe those extra trips are over i.e. per week/month. They say Birkenhead Transport have the fastest growing bus patronage after the NEX and as well as double deckers being added in February, eight additional peak trips will be added to the timetable. On rail they say “Further line speed, interlocking works and signalling works to improve journey times are being targeted for the March/April 2017 timetable recast.” – although this does also suggests the new rail timetable might be being pushed out a little. On Friday 21 October, they say for the first time ever had 100% punctuality and reliability on trains. I continue to hear more and more complaints about Skybus since they took over the commercially run airport service around a year ago. Being a fully commercial service they sit outside of AT’s control so it’s interesting to see that they continue to be the worst performing bus company in Auckland. 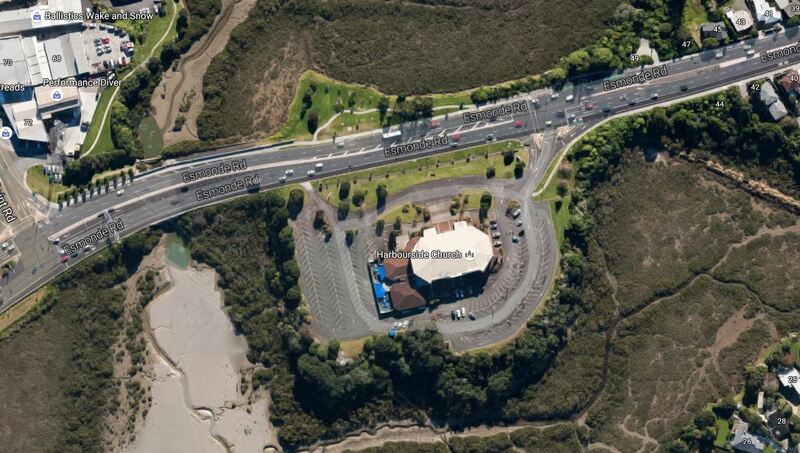 A trial a Park & Ride run by Wilsons Parking will take place on Esmonde Rd at the Harbourside Church. It will be interesting to see how popular this is, perhaps cars stuck as part of traffic on Esmonde Rd, and seeing buses wizz past in the bus lane might decide to pull off and park up. An indication as to some of the things going up to the board and board committees in the next month. There’s certainly a lot going on. Regarding punctuality and Birkenhead Transport, one way they seem to be managing a year-on-year improvement is by having completely unrealistic timetabled journeys, i.e. building in excessive redundancy in their timings. 973/974 buses travelling to/from the city stop at Highbury Shops and Verrans Corner for 5 minutes or more in order to keep time. Effectively this is great for Birkenhead Transport and their AT stats but it is awful for the commuter who sits on the bus with no passengers getting on or off. Agreed. All you want to do is get home but instead remain seated/standing for over 5-7 minutes while they pad the timetable out. It seems to have not taken into account the near continual bus lanes from Hobson Street to Highbury and the good of the bus lanes is undone! Same thing happens on the 955. On the northbound evening services there are often two long stops. One at Glenfield shops then again at the junction of Glenfield and Wairau roads. So a journey that could be done in 30 minutes usually takes 40 to 45mins. Agreed that measuring punctuality is a completely useless benchmark. Frequency and the gap between services is a much better way to measure customer experience. AT should scrap the timetables for frequent network, and introduce useful benchmarks. However, on local connectors, which are infrequent, the timetable should be realistic, and timed stops are very important. There is a great book called the Maintenance of Headway by Magnus Mills that is based on the ridiculous notion of bus companies using punctuality as a benchmark. It is meant to be satire but it seems AT/BT are using it as an operations manual. True, you often see buses waiting for a while at Highbury shops. Probably they assume a worst case congestion scenario, which in that area would be pretty bad any time of the day. If you drive, you can get stuck in congestion any time during daylight hours. Last weekend there was a queue on Onewa Road going to the motorway all the way up to Highbury shops in the middle of the day in the weekend. It looked almost as bad as a Monday morning. If those buses wait there every single day they should make the timetable a bit shorter. As it is those buses are quite slow. On the other hand, you risk getting a situation like on the east coast bays, where buses randomly arrive up to an hour behind schedule. For 973/974 that wouldn’t be too bad given the 15 minute headway, but in case of those northstar buses (which are hourly even during the peak) it makes it impossible to catch a bus without waiting for almost an hour. Be careful what you wish for. Based on how the signals are running now, removal of the double left at Nelson will probably result in increased delays for pedestrians and cyclists. Just like all the other places where slip lanes have been removed. So I don’t know how that is great news for anyone. Sliplanes can be safer in some ways because pedestrians exercise greater caution and improved visibility for heavy vehicles. Yes the biggest delay is probably for cars turning left on Fanshawe Street, as is currently the case at Wellesley Street. Other people may have a little bit more delay due to having a longer cycle. If those slip lanes are not going away they should at least get a proper way for pedestrians to cross. Either a signal or a zebra crossing, depending on how many pedestrians are passing by. There are some slip lanes with zebra crossings that I would agree are actually beneficial for pedestrians, but I stuggle to see how the removal of this particular slip lane could be detrimental. All it does a the moment is break a pedestrian’s journey from bottom left to top left into two crossings. Only if they intentionally change the cycles to cut pedestrian time, rather than hold it constant. Would be bizzare to install cycle lanes and use that as an excuse to give pedestrians and cyclists less priority at intersections. is lightrail on Dominion Road actually dead? Speaking to someone from AT, it sounds like it’s up to (National level) politics at this point. No, just in Decade 2 2028-2038 atm. Two business cases are being done simultaneously, one for a Bus Based Option & the second for LRT. The business cases include to the Airport as well, they are due around December. re: the Nelson/Fanshaw street slip lane – the timing is interesting because the helpful AT rep at my office this morning indicated that she suspects the Nelson/Quay street cycling link, in whatever form, should be done before May. She was a stakeholder, but still hadn’t seen any designs though. Has anyone heard any more about it since there were rumblings about Market Place being used instead of Sturdee Street? The concept of high performance “Mass transit” on Dominion Rd is accepted by all, the discussion is basically whether it is a rubber wheel or steel wheel system that is best. It was never alive. “What is dead may never die” – The Iron Born. Shame about the slip lanes. Some days I park in the Civic and always go the full length of Nelson St since the cyclelane has totally stuffed the left turns into both Wellesley and Victoria Streets. You see long lines of cars waiting to turn left, all polluting the world waiting for a cyclist that doesn’t exist. Now they want to stuff up Fanshawe as well. Oh well the brave new world where ideology matters and actual outcomes dont. Fifty years of “pro-car-at-all-costs” decisions breezily treated as a natural outcome rather than a concious ideological choice. You’d make me laugh, if I wasn’t crying at all the damage folks like you have done to our world, our environment, and our bodies. So having 10 to 15 cars sitting at those left turns waiting and creating fumes because there is a green light on a cycle phase with nobody using it is somehow good for the environment? Clearly I am a bit dim- so maybe you could explain how the extra CO2 is helping the world. But please don’t tell me that those naughty people should stop driving and ride a bike instead because they clearly haven’t made that choice despite the crap ideology. Trade up to a modern car with stop/start technology or buy an electric if your CO2 footprint keeps you awake at night. As an occasional rider on Nelson St, I agree that these intersections are awkward. Relying on a beg-button would be a pain, but if they could set up a detector to trigger a beg-button that could work (with beg-button as back up). This should keep the same experience for bikes, and avoid the ghost-bike-phases for cars. Are detector-based signals in place on any cycleways? As far as I know, the technology exists and is used at intersections already, can’t be a huge leap to wire it into Nelson st.
“Trade up to a modern car”. So the solution to traffic and emission issues is to become middle class with disposable income to spend on a modern car. So simple! We could all become billionaires and then none of us would have to go to work in the morning either – traffic problems solved! Ideologies aside, you can check how many people pass by on each mode. I’ve commuted along that crossing for a while, and during most of the green phases you don’t see any cyclists at all. So a long green phase for the cycleway is not a benefit to anyone. For drivers, you really need to take one of these left turns to get to the North Shore. There’s no way around this. – You can’t go around the block in any way: Nelson Street is one way, and Albert Street is a big building site. – Due to traffic light phasing in the area, the Wellington Street on-ramp is de facto closed for traffic coming from the CBD when traffic is busy. – taking the bus: you can wish otherwise all day long, but for many people that’s prohibitively slow, or not possible at all. Cycleway addition is not about how many people currently ride but how many will ride when the option become a viable one. Appealing to current numbers is not really relevant. This is more sophisticated street space allocation because it understands and admits that what we build on our streets creates how we use them. And they still can. They have just finally been put in the correct place in the street heirarchy. Yes cars have their place in the street hierarchy, but we also need to be a bit pragmatic about this. These cars are not going away just because they get stuck at a traffic light. Quite the opposite, actually. The current situation works OK. That 10 to 15 car queue will probably get through in a single phase. Maybe a few will have to wait another phase. Too bad, but that’s just how driving in a city works. But if they mess this up, traffic going north has nowhere else to go. It will back up on the other streets and there, instant gridlock in half of the CBD. So drivers get stuck for who knows how long, and then they see just a few cyclists passing by in all that time. Guess what are they going to think about that? (1) This is great, in 10 years there’s going to be a lot of cyclists here. (2) What a pie-in-the-sky waste of time and money. I hate cyclists. Anyone who thinks (2) is not going to be a popular thought, is fooling himself. Not very productive if you want to promote cycling. If I would be commuting there I would be quite unnerved, since I may share the streets with those same drivers for a long time. Will they mess up? I don’t know. Given how driving in the city basically still works after digging up almost all of Albert Street, I’m not expecting too much mayhem after a few comparatively minor tweaks on Hobson Street. On the other hand I don’t think it’s prudent to just brush this off as just some trolling. A while ago someone messed up rather spectacularly at the off-ramp at Western Springs. The result was a long queue (about half a km IIRC) of stopped traffic about half a km long in otherwise light traffic. A good way to get a few accidents over there. In the CBD, they probably honestly are. Car trips to the CBD are so marginal already. “And leads to the kind of silly arguments like mfwic’s above; how many angels on a carbon belching pin, etc…” Patrick R you should join the Green Party, I imagine there must be lots of people there like you. A few years back they convinced the Government to bring in a new policy for solar hot water heaters. The result they achieved was less solar hot water heaters being installed! Ideology 1 – Actual Outcomes nil. Sailor, no they’re not. A lot of people really have to get to work in the morning. They won’t be able to quit their job just because something adds 15 minutes to their commute. And they’re far from marginal, half of the people crossing the harbour bridge in the morning still do so in a car. Many of them have no hope of switching modes in the near future. Maybe some of them can switch to cycling after the skypath is built. Maybe some can switch to PT, but only a small part of the shore is covered by PT, and AT doesn’t have a lot of ambition to increase that coverage. The part which is covered is prohibitively expensive for most people. And yeah as mfwic pointed out, this is exactly how the greens fail so miserably whenever they get to join the government. They’re so naive they actually end up being being harmful. This was the same line die-hard drivers were using on the North-Shore for the Busway was installed. Two lanes with hardly any buses on them, what a waste! Still early days, but when we have an actual linked up cycle network that has been bedded in for a few years, I wonder if this argument will also die like it did for the Busway. And the vast majority of that half never enter the CBD. That’s right Sailor Boy most go elsewhere because there is a land use consequence every time some idiot makes the CBD less accessible or convenient. I too am exceedingly glad we are no longer doing this. Now we are beginning to recognise that making a CBD more accessible and convenient for motorists makes it less convenient and accessible overall. Roeland – I can’t imagine many of the people crossing the Harbour Bridge heading north to get to work all day travel down Nelson St at any point on their route. @jezza, you will travel down at least some part of Nelson Street and take one of the left turns when coming from mid-town. Eg. Mayoral Drive → Cook Street → Nelson Street → Wellesley Street, and to the motorway. You can’t go via Albert Street anymore. You definitely don’t go to the Wellington Street on-ramp, the ramp meter ensures you’ll be waiting in that queue for at least half an hour. That was a lot of fun when they just opened that cycleway. Initially the left-turn phases were quite short, so only a few cars could turn at a time. The queue would then back up all the way to Union Street, and block Cook Street, Union Street and the top of Hobson Street. Eventually some drivers adapted, and they made this phase a bit longer. For cyclists it doesn’t make a lot of difference whether their green phase is 30 seconds or 45 seconds. (I assume 30 seconds is the minimum due to pedestrians crossing the width of Wellesley Street). For car drivers it makes the difference between 20 minutes delay, and 5 minutes delay. The current situation I think works reasonably well for everyone, including any future cyclists). @Josh also good point, I was quite surprised that the usage isn’t higher already. But now that I think about it, it’s more or less a dead end at Victoria Street at the moment. So basically we don’t know anything until this cycleway is connected to Queen Street and Quay Street. Roeland – I assume what you are describing there is people who travel to work on the Shore by car from their house in the CBD, how many people actually fit this demographic? I would have thought car use per household would be much lower in the CBD anyway, as it costs a fortune to store one there. Most people travelling across the bridge to work on the Shore will surely be passing though the CMJ or along Fanshawe St if they come from the eastern bays. I used to fit that demographic. For me, despite the congestion, driving was quicker than taking the bus by a surprisingly large margin. That was generally true for any destination outside walking distance, like Balmoral (surprise) and Newmarket (even worse surprise). I think Takapuna would be the only exception, but I didn’t go to Takapuna often. But I don’t think people heading out of the city will do something different in the evening. There’s a looooot of parking garages in that area. 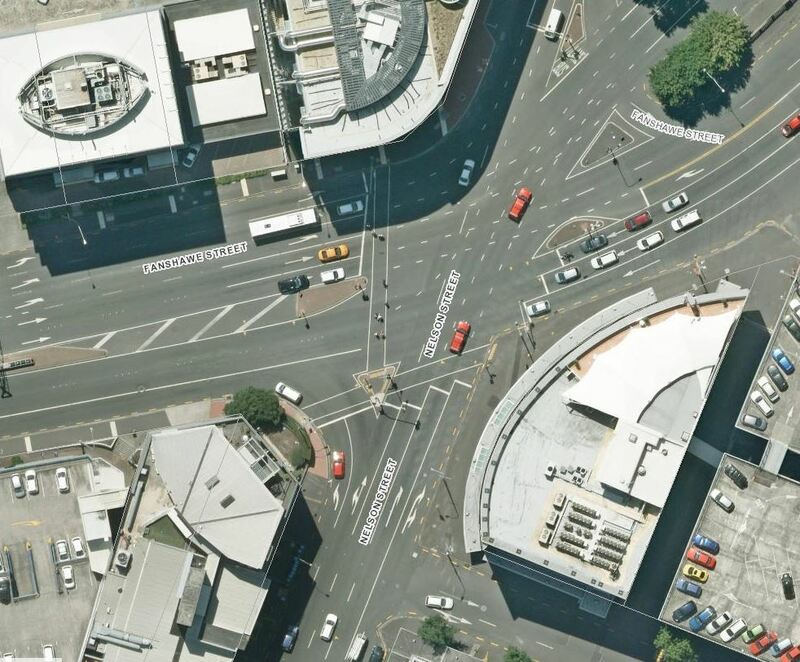 That’s an outdated satellite image of that Nelson Street intersection. At present the slip lane from Market Pl has been removed, and there’s a pedestrian crossing on the eastern side. That crossing is the reason why you can’t make U-turns onto Sturdee Street. A slip lane for a tiny local street like Market Place. Who ever came up with that stuff? The conventional slip lane “theory” is based around the qualities of the main road, not the side road. The idea is that because Fanshawe St is a high speed arterial road, you want people to leave Fanshawe St at speed, and to be up to speed before joining it the other way. Otherwise drivers on Fanshawe might have to think about potentially slowing down at some point. All about the flow yo. Ah I was thinking about the left turn lane hidden in the top right corner of the image. (the one which is now gone) Technically that’s not a slip lane. Market Street is most definitely not an arterial. Not me Nick but if you mean the signalised turn from Market Place to Fanshawe then presumably it was put in to allow trucks to leave the vegetable markets and get to Hobson St. Why wouldn’t it make sense to have that turn? Would you rather have sent them right and do a much longer trip? The island there was probably put in as the big intersection then needed somewhere to put some traffic light poles. Again would you have left them out? Maybe they shouldn’t have made any provison for trucks to and from the markets, they could have just put in a cyclelane instead and then wondered why trucks still turned up, but they didn’t do that because back then they didn’t have numpties in charge of things. Nice rant mfwic, I said nothing about not having the turn but by all means argue away with yourself! The trucks could use Halsey Street and Wellesly, or Quay Street to access the motorway from the markets. The more I think about it, the better closing Market St (or making it northbound only) at this intersection makes sense. Hopefully this will start the trend of of Park & Ride lots being priced. A practical problem with that location for park and ride is that to get to that point, you’d have to had sit in traffic for a good amount of time no matter where you’re coming from. The buses coming from Takapuna are already full, so it would make more sense to have it nearer Akoranga Station, but then again, to get there, you’d already been sitting in traffic for a while. A Bayswater park and ride would probably make more sense, but then the ferry fares aren’t part of the zonal system and don’t allow for transfers. It’s a bit of a mess… While trial is something I’m happy for, I do not predict this to take off. Maybe they can try bike parking, this is one of the better areas on the North Shore for cycling. I think that Wilson’s should set up a park n ride on the street verges around Albany Station. It might just about pay for all the damage that is being caused by all the vehicles that are currently parked there. Bizarrely AT do nothing about this parking problem, but we received a ticket for leaving a car parked over our own driveway. I constantly despair about AT’s inability to fix transport issues with their almost total efforts focused on car based solutions at the expense of public transport. On a positive note when I traveled from Takapuna to Parnell recently I was amazed at how easy it was, transferring from one bus to another on Wellesley St. Just a shame that the driver almost talked me out of making the journey insisting that he wasn’t going to Parnell although the bus signage clearly indicated it was. *Thinking Cap On* And please think through before instantly dismissing. How about keeping a single left slip lane for vehicles coming from further up the road to still allow for this traffic flow onto Fanshaw. The next lane in could be converted to a cycle lane (with physical barriers to protect cyclists) This would then put the cycle lane in the correct location to get through the intersection. The traffic island would then be relocated West slightly (since there would only be one slip lane there now (and enlarged for pedestrians). I think since this is such a large intersection it does provide a benefit having this traffic island there to decrease the distance required to cross the entire intersection for pedestrians. Traffic from the next lane on Nelson could still turn left (into Fanshawe) when allowed to do so (as I assume is the plan with the removal of the slip lane proposal) or continue straight ahead (into Market Place) with the 2 right lanes being for turning into Sturdee and Fanshawe respectively. So to summarise – you would lose one traffic lane on Nelson St. You would lose one slip lane. You would gain one protected cycle lane (in a good alignment for the crossing and providing 2 options for turning left into Fanshawe and making it easier to leave the cycle lane if wanting to turn right into Sturdee or Fanshawe citybound too as there wouldn’t be a wall of cars stopped waiting to turn left). You would minimise congestion throughout half the CBD (a long line of cars not moving anywhere since turning left from Nelson into Fanshawe is one of the few ways of actually getting onto Fanshawe – especially if they eventually remove Quay St. Pedestrians still have a traffic island to reduce the distance needed to cross (particularly for elderly/disabled) and it would be enlarged. I don’t get it – how are you figuring a straight-through protected cycle lane + a slip lane? At some point the cars would need to cross the cycle lane. The most common arrangement in Belgium is the cycle lane staying on the left of the slip lane, and crossing just before the intersection. Cars on the slip lane have to give way to cyclists and pedestrians crossing. The advantage over having the slip lane entirely on the left of the cycle lane is that you have an unambiguous point where cyclists and cars cross paths. @TLD. 2 options really (or both). Further up Nelson Street at the next intersection with Vic St West you make the slip lane go all the way down from there (except perhaps where other intersections are (Vogel, Gorst, Wyndham – actually can probably not do Wyndham). Or as Roeland kinda says you have a designated spot half way down Nelson Street where the cycle lane moves from the hard left into the 2nd lane. Have it as a raised table perhaps with clear markings to indicate that motorists give way to cyclists. Or have it signalised so that it automatically goes green for cyclists as they approach while allowing cars the rest of the time. I think the comments re Skybus services are a bit harsh. Having been involved with running services through Auckland Airport I can understand how hard it must be for them to keep time. There are now numerous sets of roadwork getting from the airport to Hillsborough Road. All traffic from the east side of SH20a is currently exiting on to SH20a while the Massey Road/Westney Road intersection is being upgraded, and it’s currently closed. Most of this traffic is then opting to travel through the airport if it is wanting to head east via SH20b/Puhinui Road as it cannot turn right from SH20a into Massey Road due to the roadworks it this intersection. The congestion into the airport now starts early in the afternoon. AIAL then decided to close of the entrance into the Domestic Terminal to one lane for 3-weeks while they reconfigured the lanes here, and at the same time they widened the lanes at the roundabout at SH20b/Tom Pearce Drive intersection thus compounding to the traffic issues. The SH20a roadworks at Massey Road/Kirkbride Road have created some delays and there are now roadworks on Onehunga Bay on SH20. You’ll see that all services running via the airport, Tranzit and Skybus, both dropped on punctuality and reliability during October due to this factor with delays of 60-minutes to services getting through the airport. It will be a bit harder to track this the Go Bus 380 services being lumped into one from the end of October. Wait till the Christmas rush starts and they will really blow out.